It is true that we can learn a lot from the video game series Assassin’s Creed; we share many similarities with the series even if many do not know why, or are even unaware of it. Whilst we don’t and never will use violence, the characters depicted within the games do but for very different reasons. Assassins: The main characters who fight on the side of good; they fight for freedom, peace and free will, and oppose corruption and hate. One of the rules which has been present throughout each game when you play as an assassin is ‘stay your blade from the flesh of an innocent’. This is the fundamental ‘Creed’ which means you must never harm civilians. Templars: The primary antagonists; they want peace but at the cost of controlling all civilisation. They use fear, intimidation and corruption to gain power. They are also not above killing innocent people; as shown in Assassin’s Creed III when they kill three males from the same family (even a young child) in a spiral of corruption so they can rise to power. Each game of the series takes part in different periods of history and showcases various historical figures. However, the bottom line is that they are works of fiction created by a multicultural team of different ethnicities and beliefs, with the most recent game being set in Ancient Egypt. But how can we learn from the series itself? Through it we can learn of the actions of the Templars and the methods they use to seize power as well as the atrocities they commit to those that try to stop or oppose them. I now compare the far-right to the Templars based on their actions. They are trying to brainwash the population and control what we think, and control what we say. 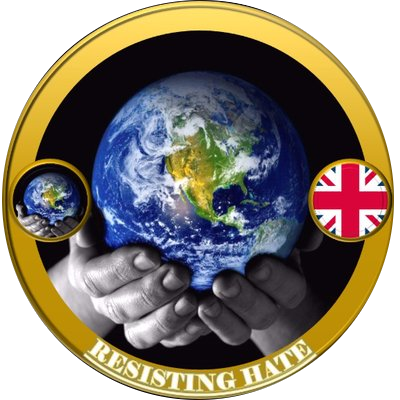 Should we oppose them, they use intimidation and threats of serious violence to try and stop us, especially the likes of Paul Golding and Tommy Robinson. These men both put out wanted posters on two activists, indicating they mean harm towards these people. But then there’s us, the nonviolent ‘assassins’. The only things we ‘kill’ are the social media accounts related to the far-right, and this is something which we have been very successful with. So, I suppose that’s how you could say how we are akin to the assassins, because we bring an end to their influence and corruption. We believe in freedom, peace and free will (within reason). We believe in equality and a world where everyone can live in peace regardless of religion or race. If you scroll through various historical events involving opposition and examine what caused them, we can observe a good and bad side in many of them. One such historical event is the Boston Tea Party (used in Assassin’s Creed III) in which the assassins send a powerful message to the Templars. Assassin’s Creed: Syndicate in contrast does not depict a specific historical event in this way but instead portrays a Victorian London fully occupied by the Templars who use child labour to work their factories. Sadly, this practice is not a work of fiction but is something all too real and true from history; workhouses where orphan children and even poor people were forced to work. Within the game narrative, two twin assassins fight back to free London so that it can live in peace and freedom. On many occasions the games greatly stress how evil the Templars are. Their goal is to obtain a piece of Eden, a technological remnant of the highly advanced Isu, an ancient civilisation responsible for the creation of mankind. Control of this artefact will enable them to plunge the world into slavery where they hold the chains. But always fighting back, lurking in the shadows, are the assassins, their identities largely hidden from civilians. In every game the assassins prevail; and this just goes to show that no matter how much power you wield, the harder you’ll fall when it all crumbles around you. The far-right are the Templars. They are trying to brainwash people into their way of thinking, and trying to make us out to be the evil ones. So many people can see that it is them that are the problem, not us. Like the assassins, we fight back for freedom, free will and peace. If you read up on the overarching plot of the Assassin’s Creed games, the antagonists and what they did to wield power and incite fear, you’ll soon learn that it’s exactly what the far-right do today. They use violence, but we at Resisting Hate don’t. Violence begets violence, and in a such a fight there are no victors. In a diplomatic fight using reason, logic and the law there is, however; and that will be us. As the far-right Templars, the power they wield will crumble. They’re pushing so hard to force people to turn on minorities, and it will be their downfall. People are rising and taking a stand. They’re starting to see the far-right for what they are, and the only people who won’t listen to reason are those who are too blinded by their hate that they’ve lost all sense of reason to see the truth. They are blinded by lies and false hope, all created by the far-right, whereas as those of us who are not far-right or left have a wide range of political beliefs; I myself have no political allegiance to any party, I’m not left or right but independent in my political beliefs. We create real hope; the hope that keeps people living in belief that one day we will all live in peace, equally, and in freedom. We strive for the day when we will all enjoy living together in our diverse multicultural communities. That’s what makes us stronger, and that’s why we will win. 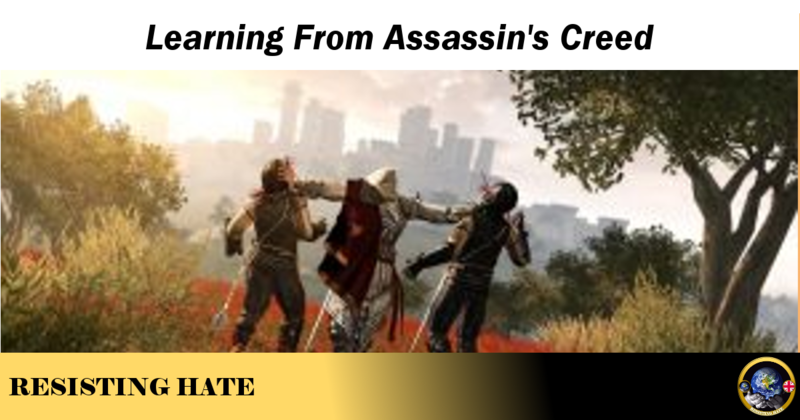 In this regard we can learn from Assassin’s Creed. It shows us two factions who want different things for different reasons, the good and the bad. Resisting Hate are the good and the far-right are the bad. We want peace, freedom, and free will whilst the far-right does not. Instead they want to create a Christian world, ensuring Christianity is the only remaining religion. Therefore, I label them as Christian Extremists. In World War II, members of your religion were vilified for their beliefs. They were tortured, murdered and had everything taken away from them. Just for their beliefs. So, you should know to a degree how it feels to be repressed and vilified for that. Yet, you vilify Muslims for their beliefs. Which makes me wonder whether you’re even Jewish, or just have zero understanding of what Jewish people went through during the Second World War. You’re lucky that it wasn’t you sent to a concentration camp or to a gas chamber. But you happily call for exterminating Muslims for their beliefs? You are the saddest, most disgusting and heartless person I’ve ever come across on the Internet. Within the narrative of the Assassin’s Creed games, a company called Abstergo Industries serves as front for the modern-day Templars. In the storyline, they kidnap a man named Desmond for his ancestral memories. The historical segments of the games come via a machine called the Animus, which allows Desmond to relive these memories. As with the ancient Templars, the ruthlessness of Abstergo is stressed; one example is shown when a team of assassins try to rescue Desmond, but Abstergo slaughters the attackers before this can happen. As the series progresses, we learn more about the Templars and their evil in tandem and as a parallel with what we learn about Abstergo. So, it is fair to say we can learn from Assassin’s Creed. Not to the extent that we should go around killing the far-right to free people from their corruption, of course, but instead to learn of how they incite fear and extend their control over people, and what they do to those who stand against them. This is exactly what the Templars do in the Assassin’s Creed series; they vilify all those opposed to them, attack the weak and corrupt the minds of the many. Hate speeches, corruption and blackmail, inciting fear, murder, forcing people to their way of thinking; these are the exact same methods used by both to gain support. Through this they gain their power, and they believe their ideal world should be free of minorities, controlled through fear and corruption. To a lot of people, it might seem I play too many video games; I do play a lot, but it makes perfect sense. It only occurred to me very recently that the far-right are exactly like the Templars, with Donald Trump being their Templar ‘Grandmaster’ who controls them all. But we also have Tommy Robinson as the UK Templar Grandmaster, peddling his corruption and deceit through his books, and his brainwashing through his show by Rebel Media. Then we have Anne Marie Waters and her Nazi Templar party, using terrorism to spread fear and gain power through brainwashing people to her way of thinking. All the far-right are like the Templars in that they want to control every aspect of our life, what we do and who we believe in. They’re forcing us to believe that Allah was a child molesting murderer; that’s their argument every time. They know people will side with them simply using that argument alone. But where is there evidence to support this? Where is the official documentation from that era to prove it? Instead, they claim they translated the Quran and that it speaks hate. Are they fluent in Arabic? No. Anyone can claim what the Quran translates to. They’re fuelling Islamic terrorism with their hate, which in turn brings more people in to listen to them and believe them. ⟵Must Love Stop At The Borders? Completely wrong analogy. The templars are no more evil then the assassin’s. They both kill to advance their aims and both sides have used pieces of Eden to control peoples actions throughout the series. If you wanna use a game franchise to highlight the wrongs of the right may I suggest Cerberus from the mass effect series. They are a highly xenophobic organisation that are funded by wealthy industrialists and fronted by a demagogue who argues for human supremcy and a human first agenda.